Malawi’s late president Bingu wa Mutharika was buried Monday in an imposing private mausoleum dubbed the ‘Taj Mahal’, as both critics and leaders of his party stressed reconciliation. New President Joyce Banda, southern Africa’s first female head of state, urged the nation not to dwell on Mutharika’s mistakes after he died in office aged 78 on April 5 accused of steering the economy into meltdown. “He was not an angel, he made mistakes, so let us not remember the bad things, let us remember about the positive things about Bingu,” said Banda — an ally-turned-critic, to murmurs of approval from thousands of mourners. 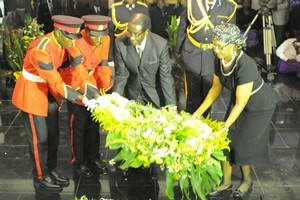 Several African leaders and around 3,000 locals attended the burial on his farm in southern Thyolo, which was broadcast live on state radio and television. A 21-gun salute boomed as his body was carried into the family mausoleum on a two-gun artillery carriage flanked by motorcycle riders to the white marble edifice where a funeral mass was held. Mutharika’s casket was draped in the Malawian flag, which was handed to his wife Callista, before his remains were lowered into a grave beside that of his first wife Ethel. Only family, the heads of state and leaders, and Catholic bishops were allowed inside the mausoleum where they laid wreaths. The former World Bank economist designed the building himself and called it ‘Mpumulo wa Bata’, or ‘peaceful rest’ in the main local language Chichewa. But the country’s media has dubbed it the ‘Taj Mahal’ and reported the funeral would cost $1.5 million (1.1 million euros) in one of the world’s poorest nations. African leaders praised Malawi for its smooth transition after a two-day delay in announcing Mutharika’s fatal heart attack prompted fears. “We congratulate you for the orderly and smooth transition which helped to entrench and cement the rule of law,” Mozambican President Armando Guebeza told mourners, who also included presidents from Namibia, Kenya, Tanzania and Zimbabwe. Guebuza praised the late leader as one of the “greatest sons of Africa who had a distinguished career as a fully-fledged international economist” working for the World Bank, the United Nations and regional bloc COMESA. Mutharika’s second term was marred by accusations of autocracy and a crackdown on democratic freedoms but he drew early praise after taking office in 2004 as a graft buster and for ending a devastating famine. In the crowd were supporters wearing free funeral cloth emblazoned with Mutharika’s portrait, and attire with slogans such as “100% Bingu” and “Bingu …rest in peace”. “Our hero is gone and this was my first time to see a president’s funeral and see everybody accord Mutharika respect,” Nanyati Nkhoma, a villager from Mutharika’s village of Kamoto told AFP. Mutharika, notoriously prickly to advice and criticism, was increasingly blamed for fall-outs with donors over concerns of his governance and economic policies. In July, frustrations fuelled by chronic fuel and foreign exchange shortages exploded in the normally peaceful nation with police gunning down 19 people. Mutharika’s brother Peter, already groomed as presidential candidate for 2014 polls, praised his sibling as an “extremely wonderful human being and great man”. “Although he made mistakes of judgement, he made them not out of evil,” he said. Born Ryson Thom in 1934, Mutharika came in for renewed criticism before his death, with demands for his resignation.